Updated 7/10/18: Jason Momoa has been cast in the lead role for “futuristic epic world-building” series See, according to Variety. Apple is said to be spending as much as $1 billion over the course of 2018 on original TV programming. That’s a lot of TV! It’s not the $8 billion Netflix is going to spend, but it’s still a huge commitment. What can you get for a billion dollars? Well, some simple math gives us 200 episodes at $5 million a piece (a reasonable per-episode price for high-end TV). But we’re not likely to actually see 10-20 shows with 10-20 episodes each, all costing around that much. For starters, that billion dollars has to cover a lot more than per-episode production costs. Apple TV 4K is the most expensive streaming box but there are more than enough reasons to justify the price. The bulk of Apple’s TV content is likely to be in production throughout 2018, with actual release dates in 2019. We’ll probably see a mix of show types, from reality TV to dramas, and even a few films and miniseries, too. Currently, Apple’s TV efforts are accessed through Apple Music, but that’s not really an optimal experience. We don’t know if the company will simply release content through iTunes, the TV app, or a new channel, but access is likely to be tied to Apple Music subscriptions—at least in the near term. While most of Apple’s TV projects are shrouded in secrecy, what little we know confirms that Apple is spending big bucks on top-tier talent. The two projects released in 2017 (Planet of the Apps and Carpool Karaoke) were uninspiring, but prospects seem far better for the future. Here’s a list of all the exclusive TV content we know Apple is working on, along with expected release dates. It’s like Shark Tank for app developers! Celebrity judges Will.i.am, Gwyneth Paltrow, Jessica Alba, and Gary Vaynerchuk sit through pitches by app developers who go on to try to earn big VC money. Famous entrepreneurs judge apps, with the winners scoring big VC money. It’s…not great. There’s nothing inherently wrong with Planet of the Apps, really. It’s just sort of boring. Each of the 10 episodes is nearly an hour long, and doesn’t manage to capture much drama about the developers or the challenges they face in bringing their ideas to market. It all moves too slowly, and feels crammed with “celebrity factor” where the developers should really be the stars. The whole exercise feels like it was made for Apple (because Apple = Apps!) instead of for viewers who want to watch an entertaining show. 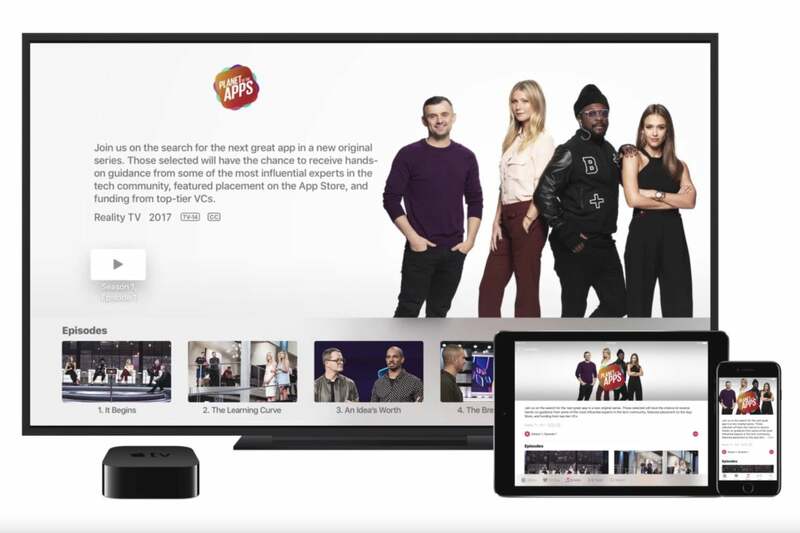 Planet of the Apps has 10 episodes in its first season, which premiered on June 6, 2017. No second season has been announced. James Corden has this great bit on The Late Late Show where he hops into a car with celebrities and they sing along with the radio. See? Celebrities do the things we do! It’s usually a short six- or seven-minute segment that can be quite entertaining. You know, just the right thing to go viral on YouTube (as several segments have done). What better thing to turn into a TV show that plays only on a music service, right? James Corden hosts the first episode with actor/rapper Will Smith, as well as the final episode, but none of the others. Unfortunately, the tight, breezy pace of The Late Late Show segment doesn’t translate well to a series where each episode is about three times as long. Perhaps it only works as a “break” from the in-studio talk show. Perhaps the whole concept is just a bit old and boring. Maybe it’s Corden who makes the magic—he only hosts the first episode and the 19th and final one. For whatever reason, the hit segment simply doesn’t translate into a hit show. Carpool Karaoke: The Series premiered on August 9, 2017. It ran one episode per week for 19 episodes, with the last one posting on October 31. CBS Corp. CEO Leslie Moonves announced on February 15, 2018 that Apple has ordered a second season of the show. The season premiere date has not been announced. On the French premium cable channel Canal+ you’ll find a new series named Calls. It’s ten-episode arc for the first season consists of ten ten-minute episodes. Each consists of a playback of an audio recording—an airplane black box, a voicemail, a 911 call—that depict some sort of tragedy. They all tie to together to tell the story of some sort of impending apocalypse. It’s a neat idea, if a somewhat odd format. According to Variety, Apple has now bought the rights to make an English-language version, along with the rights to the first season of the French version. You can see a trailer for the French version below. Calls has no release date yet. The creators of Sesame Street are making several new series for Apple. No, it’s not Sesame Street, but it might be close. According to Variety, Apple has struck a deal with Sesame Workshop, the non-profit organization behind Sesame Street, to produce children’s programming for its streaming service. Nothing is known yet about the shows, but they very clearly won’t be Sesame Street (which has a multi-season deal with HBO and still airs on PBS). Variety reports that this is a multi-series order, including live action, animation, and a even a new puppet series. We do not yet know the names, themes, or release dates for any of these series. According to various online reports, Winfrey will continue as CEO of OWN, the TV network she started in 2011. The Hollywood Reporter states that the deal includes any content that can be distributed through Apple’s venues, such as books, movies, TV shows, or applications, though podcasts are not included. Deadline reports that Apple has agreed to a 10-episode straight-to series run for a mystery drama inspired by the life of pre-teen journalist Hilde Lysiak. The series will be about a young girl from moves from Brooklyn to a lakeside town, where she gets involved in uncovering a cold case that the community has concealed. Dana Fox and Dara Resnik are the creators and executive producers of the series. Lysiak runs Orange Street News, which features her writing and local reporting in Selinsgrove, Pennsylvania. At the age of 9, Lysiak made headlines beyond her neighborhood when she broke news on a murder in her town. A release date has not been announced. The hit novel Shantaram has a somewhat tumultuous history in Hollywood. According to Variety, the book was first to be developed as a film, with Johnny Depp having acquired the book rights and Warner Bros. producing with Joel Edgerton in the starring role. Then, the plans were scrapped and the rights auctioned off, with Anonymous Content and Paramount Television winning the rights to Shantaram and its sequel novel The Mountain Shadow. Now, Variety says, Apple has won the rights to develop the series. Eric Warren Singer (American Hustle, The International) will write and executive produce the series. Gregory David Roberts’ novel tells the story of Lin, an escaped convict from a maximum security Australian prison. On the run and cut off from friends and family, he disappears into the Bombay underground in India. Shantaram does not yet have a release date. J.J. Abrams and Sara Bareilles are executive producers of this half-hour comedy/drama series. Variety reports that Apple has ordered a 10-episode season of the show. Variety says the series is described as a “love letter to the diverse musicality of New York which explores the universal journey of finding your authentic voice in your early 20s.” Bareilles is expected to contribute original music to the show. Screenwriter Jessie Nelson (I Am Sam, Corinna, Corinna) will write, direct, and produce the first episode, and act as showrunner for the series. The production companies will be Abrams’ Bad Robot and Warner Bros.
Little Voices does not yet have a release date. Dickenson does not yet have a release date. Of all Isaac Asimov’s famous science fiction work, none is as sprawling, weighty, or influential as the Foundation series. The original book trilogy (part of which was originally published as a short story series in sci-fi magazine Astounding) was published in the 1950s, and has served as influential fodder for a lot of the science fiction that followed. Last year, Skydance Television landed the rights to make a TV series adaptation of Foundation from the Asimov estate. David S. Goyer (who has writing credits on Batman Begins and The Dark Knight) and Josh Friedman (who is working with James Cameron on his Avatar sequel and a Terminator reboot) will serve as executive producers and showrunners. According to a scoop from Deadline, Apple landed a straight-to-series deal for the show, but we don’t know much more about it yet. Foundation does not yet have a release date. According to a report from Deadline, Apple has signed a two-season, 26-episode order for a new animated music comedy called Central Park. The show is produced by 20th Century Fox TV, and is the brainchild of Loren Bouchard (creator of Bob’s Burgers), Nora Smith (Bob’s Burgers executive producer) and Josh Gad (who voices Olaf in Frozen). Central Park has no projected release date yet. According to Variety, Apple has ordered a straight-to-series run of a psychological thriller produced by M. Night Shyamalan, the director known for writing and directing Unbreakable and a bunch of lesser movies. We don’t know anything about the series yet, except that Apple has ordered ten half-hour episodes, and that Shyamalan will direct the first one but apparently, perhaps mercifully, none of the others. The series will be written by Tony Basgallop. This series does not yet have a release date. The series will be produced by Brian Grazer and Ron Howard’s Imagine Television along with Durant’s Thirty Five Media. It will be written and directed by Reggie Rock Bythewood, best known for the TV series Shots Fired and for writing the Notorious B.I.G. biopic Notorious. Apple’s Eddy Cue talks with Kevin Durant courtside in Charlotte. We should note that Durant currently plays for the Golden State Warriors, of which Apple VP Eddy Cue is a huge superfan. Swagger does not yet have a projected release date. One of the first new television projects revealed to be in the works at Apple is revival of Steven Spielberg’s Amazing Stories. The original Amazing Stories ran for only two seasons in the ‘80s, yet was nominated for a dozen Emmys (winning five). When you saw this on your TV, you knew you were in for a good time. I wonder if Amblin will keep this title treatment? Apple has struck a deal with Amblin Television to produce a 10-episode run, with Bryan Fuller as showrunner and a rumored budget of about $5 million per half-hour episode. Bryan Fuller, the writer-producer of Dead Like Me, Heroes, Pushing Daisies, Hannibal, American Gods, and Star Trek: Discovery, is getting a beefy budget to revive one of the most beloved and awarded (if short-lived) shows of all time. We can’t wait! Update 02/07/18: According to The Hollywood Reporter, Bryan Fuller has left the project, citing creative differences. Hart Hanson, who was co-producing it with Fuller and Spielberg, will take on a larger role in the show. Update 05/22/18: Variety reports that the co-creators of One Upon a Time, Adam Horowitz and Edward Kitsis, have signed on as the new executive producers of Amazing Stories. Amazing Stories has no release date yet. Apple has tapped Reese Witherspoon’s production company Hello Sunshine to adapt the true crime best-selling book Are You Sleeping: A Novel by Kathleen Barber. We don’t know a lot about it, except that the adaptation for TV is written by Nichelle D. Tramble (The Good Wife, Justified) and will star the excellent Octavia Spencer, who won an Oscar for The Help and was nominated for another for Hidden Figures. The story is about a hit podcast (think: Serial) that reopens a long-closed murder case in the public eye, and unravels the life of our protagonist, Josie, who had finally put her troubled old life behind her. Are You Sleeping has been picked up for a full 10-episode season. Update 06/13/18: Variety reports that the show has added Michael Beach, Ron Cephas Jones, Aaron Paul, Elizabeth Perkins, Mekhi Phifer, Tracie Thoms, and Haneefah Wood to the cast. Are You Sleeping has no release date yet. Fresh off their big indie hit The Big Sick, husband-and-wife team Kumail Nanjiani and Emily v. Gordon will co-write and executive produce a new half-hour anthology series about immigrants called Little America. They will share writing duties with Lee Eisenberg, who will serve as showrunner. Alan Yang, known as the co-creator of Master of None together with Aziz Ansari, will also executive produce the show. Is Apple going to air a morning talk show? Not quite. This new series (also produced by Witherspoon’s Hello Sunshine production company) is not a morning news show. Instead, it’s a drama about making a morning TV news show. It supposedly draws heavily from the book Top of the Morning: Inside the Cutthroat World of Morning TV by Brian Stelter. Real-life buddies Witherspoon and Aniston are teaming up for a drama about morning TV shows. It’s easy to imagine that what Sports Night was for SportsCenter, this show would be for the Today Show. So far we don’t really know anything about it or when it will air, except that Apple has ordered two seasons of 10 hour-long episodes each. The writer and executive producer is Jay Carson, who served as a producer on House of Cards. The show doesn’t have a title yet (that we know of), and has no release date. In December, Deadline published an exclusive with a few juicy details of yet another Apple TV series. Written and created by Ronald D. Moore (best known for Battlestar Galactica), and co-executive produced by Matt Wolpert and Ben Nedivi (Fargo) the series explores what would happen if the global space race had never ended. We don’t yet know the series’ title (it may not have one yet! ), nor when it will be released, but it seems early in production—there’s no talk of directors or stars yet attached. Given that this is the kind of show bound to have plenty of post-production special effects, I wouldn’t expect to see it until 2019. It looks like Apple wants to cash in on the “look at the fancy homes of fancy people” TV craze, with its own unique twist. According to Variety, Apple has ordered one full season of 10 hour-long episodes of a new show titled Home. So it sounds like it will be more about design and technology than Million Dollar Listing or MTV Cribs. All the better to sell you nifty HomeKit stuff, right? Home has no release date yet. SNL alum Kristen Wiig is set to star in her first regular TV gig since leaving SNL in 2012. According to Variety, Apple has ordered a 10-episode, half-hour run of a new comedy variety show staring Wiig. The show is created and produced by Colleen McGuinness (30 Rock, About a Boy) and is inspired by Curtis Sittenfeld’s collection of short stories You Think It, I’ll Say It (which isn’t even out yet). This is the third Apple series to be produced by Reese Witherspoon’s production company Hello Sunshine. Update 06/20/18: Deadline reports that Kristen Wiig has pulled out of this project, citing scheduling conflicts with Wonder Woman 1984 (she plays the villain Cheetah in the film). The publication’s sources say that the series hasn’t been cancelled yet, and “producers are regrouping” to try to continue with the project. This project does not yet have a title or release date. Apple has put in a full series order for See, a futuristic drama. The size of the series order is not yet known, but Deadline reports that it will probably consist of eight episodes. The series is written by Steven Knight (Peaky Blinders, Dirty Pretty Things) and directed by Francis Lawrence (The Hunger Games: Catching Fire and Mockingjay Parts 1 & 2). So far we don’t know anything about the series, except that it’s supposed to take place in the future and is what they call a “world-building” series, that is, one set in a different reality than our own (think: Westworld, Bright, Game of Thrones…). See does not yet have a release date. According to Variety, Apple has gone straight-to-series (ordered a whole season of a series without first shooting a pilot) on a drama by Damien Chazelle. Chazelle is the acclaimed writer and director of La La Land and Whiplash, and is currently working on a Neil Armstrong biopic called First Man. No details have been given about the series at all, except that Chazelle will write and direct every episode. We don’t know the subject matter, the stars, the length of each episode…really nothing at all. There is no release date set for this series, but considering that Chazelle is currently in production on First Man (set to release in theaters on October 12, 2018), it’s probably a long ways out. Waaay back in early 2016, word dropped about Apple’s first homegrown TV series. Called Vital Signs and produced by Dr. Dre, it is said to be a six-episode miniseries where each episode focuses on a specific emotion (Vengence, Ego, Negativity, Innocence…). It’s also a semi-autobiographical tale of Dre’s life. This was before Apple was dedicated to spending really big bucks on its own exclusive video offerings, and thus the series was originally conceived as a way to help promote Apple Music and drive subscriptions. Andre Young, aka Dr. Dre, produced the first real Apple original TV miniseries. But it’s totally MIA. In the spring of 2017, star Ian McShane (Deadwood, John Wick), who plays Vengeance, said the series was going to release in August. Well, it’s now way past August and we haven’t heard or seen a thing about it. Not a trailer, release date, promotional art…nothing! Either the miniseries is in big trouble and has to be drastically re-worked, or it’s just so good that Apple’s saving it for a big launch of its original TV programs or perhaps a new streaming video service. By all accounts, filming appears to have been wrapped up for a long time. One Apple series we know is definitely not going to see the light of day is an Elvis Presley biography series. Rumor has it that, if successful, subsequent series would have focused on other pop stars like Michael Jackson. It was in very early development at The Weinstein Company when the Harvey Weinstein scandal broke. With no cast or crew signed up yet, it was a no-brainer for Apple to pull the plug.